This snowflake used either as an ornament or a tree topper is a great way to display all those white and translucent white buttons your mother or grandmother left you in their button jar. With these special buttons the snowflakes would be a great way to share a treasured memory with your close relatives. This would also be a great inexpensive “bulk craft” for a church children’s group or a school classroom art projects. To keep the project to one session, pre-glue and paint the snowflake. Then allow the kids to decorate their snowflakes with buttons, trim and markers. Glue four Popsicle sticks together in a “snowflake” pattern then allow the glue to dry. Give the snowflake two coats of white paint and allow the paint to dry between coats. Spray paint the sticks white before gluing them together if you are mass producing the snowflakes. For a nice shimmery finish on the snowflakes apply one or two coats of white ultra-fine glitter paint to the front of the snowflake. Allow paint to dry. Glue lace to the snowflake for a more Victorian effect. If needed cut the shanks off buttons with wire cutters. Lay out your buttons on the snowflake. Graduate the sizes of the buttons starting with the larger ones in the center. Use the smallest buttons on the ends of the snowflake. Choose a large decorative button for the center. Glue the buttons down and allow the glue to dry. Attach a hanger to the snowflake. Glue a green chenille stem to the back of the snowflake (center). If your tree is not green use a stem of a matching color. 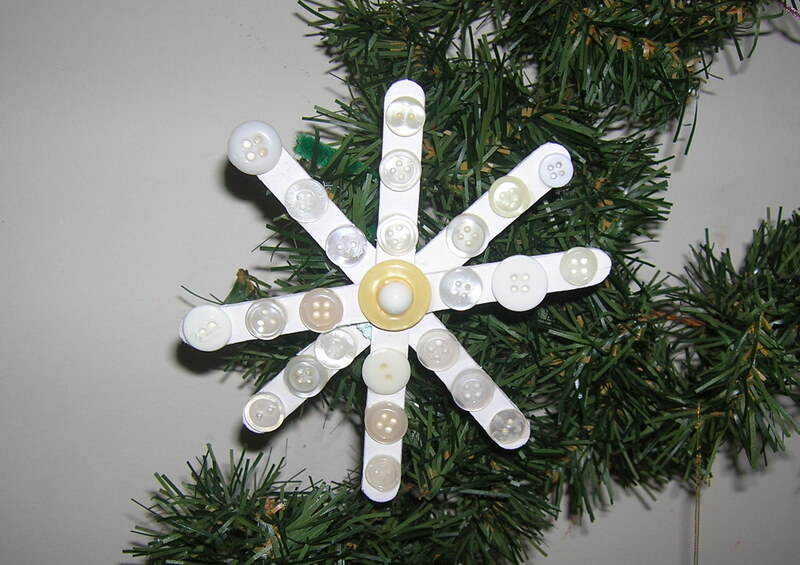 Mount your snowflakes on clothespins so they will clip to the branches. Paint the clothespins green first so they will blend into the tree. To hang your snowflakes suspended in a window tie a long strand of clear fishing line to the top of the snowflake. You are then ready to display your snowflake.